위봉사는 백제 무왕 5년(604)에 서암대사가 지었다는 설과 신라말에 최용각이라는 사람이 절터에서 세 마리 봉황새가 노는 것을 보고 위봉사(圍鳳寺)라 이름 지었다는 이야기도 있다. 고려 공민왕 8년(1358) 나옹화상이 절을 크게 넓혀 지었고 조선 세조 12년(1466) 석잠대사가 수리하였다고 한다. 위봉사 보광명전은 건축 수법으로 보아 17세기경에 지은 건물로 추정하며 ‘보광명전(普光明殿)’이라 적힌 현판은 조선 순조 28년(1828)에 쓴 것이라고 한다. 규모는 앞면 3칸·옆면 3칸으로 지붕은 옆면에서 볼 때 여덟 팔(八)자 모양을 한 팔작지붕이다. 지붕 처마를 받치기 위해 기둥 위부분에 장식하여 짜은 구조가 기둥 위뿐만 아니라 기둥과 기둥 사이에도 있는 다포 양식이다. 건물 안쪽은 천장 속을 가리고 있는 우물 정(井)자 모양의 우물천장으로 꾸몄다. 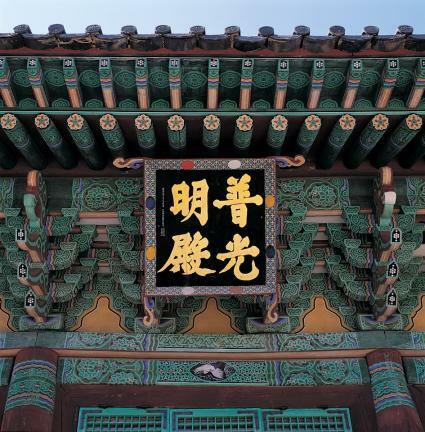 불단 위쪽으로 운룡(雲龍)과 여의주 모양의 구슬을 장식한 닫집을 만들어 놓아 불상에 엄숙한 분위기를 자아내고 있다. 안쪽 뒷벽에 그린 백의관음보살상을 비롯한 여러 불화와 비교적 채색이 잘 보존된 금단청은 차분하고 아늑한 법당 안의 분위기를 느끼게 한다. 우수한 옛 채색기법과 조선시대 목조 불전건축 연구에 소중한 자료가 되는 문화재로 평가 받고 있다. There exist a number of theories regarding the origin of Wibongsa Temple. 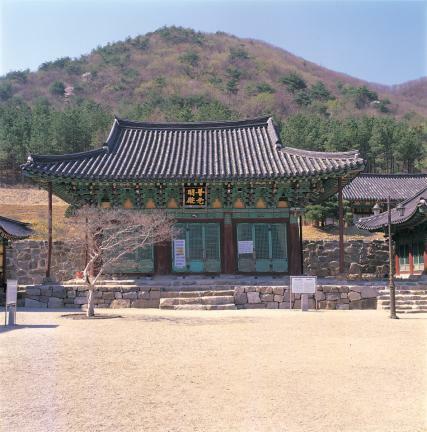 According to some sources, it was built in 604 (the 5th year of King Mu’s reign of Baekje) by the Buddhist monk Seoam. 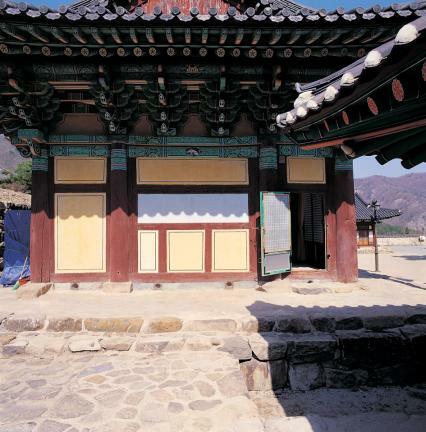 The name “Wibongsa,” according to another source, was chosen by a late Silla man by the name of Choi Yong-gak who saw three phoenixes at the site of the temple. 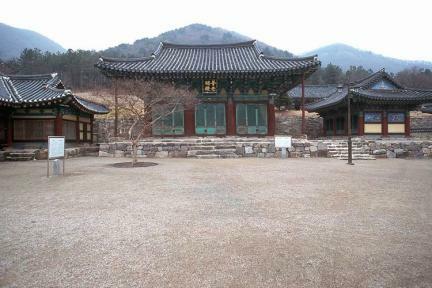 Wibongsa is said to have been expanded in 1358 (the 8th year of King Gongmin’s reign of Goryeo) by the monk Naong hwasang and repaired in 1466 (the 12th year of King Sejo’s reign of Joseon) by Buddhist monk Seokjam. 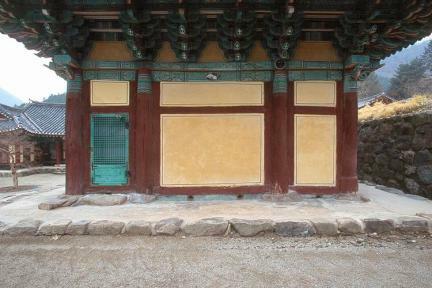 Bogwangmyeongjeon Hall, meanwhile, is dated to circa 17th century, based on its architectural style. 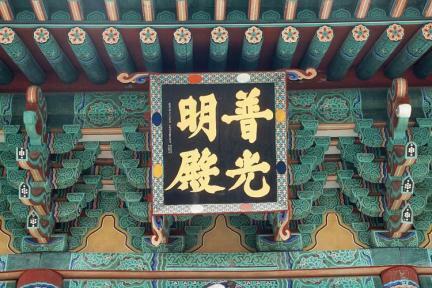 The name tablet above the entrance is said to date from 1828 (the 28th year of King Sunjo). 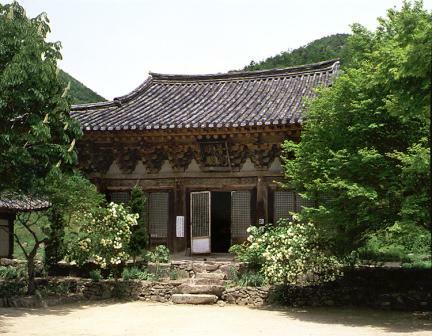 This building, extending three kan (a unit of measurement referring to the distance between two columns) on the front and three on the side, is surmounted by a hipped-and-gabled roof. 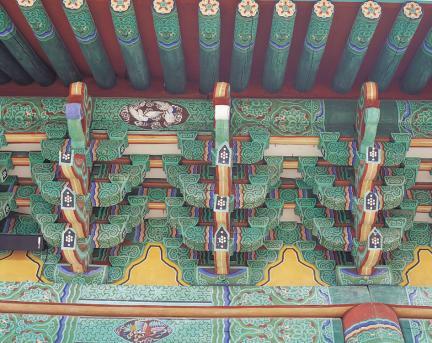 Columnar bracket sets supporting the eaves are present both at the top of the columns and between the columns. The sanctuary inside has a coffered ceiling. 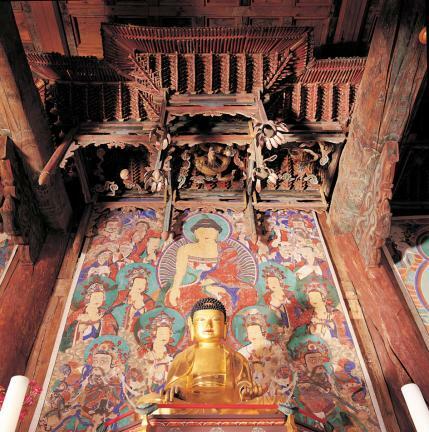 The Buddha statue sits under a stately canopy, adorned with cloud and dragon motifs and beads shaped like cintamani. 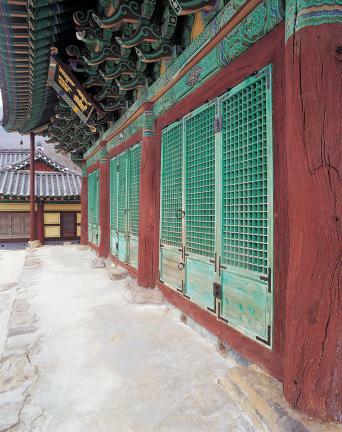 The gold decorative painting on the woodwork is still quite vivid and not at all faded. 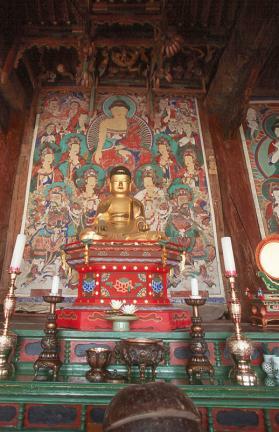 The altarpiece, a painting of Avalokitesvara clad in white, contributes, along with a series of other Buddhist paintings next to it, to the solemn and serene atmosphere of this place of worship. 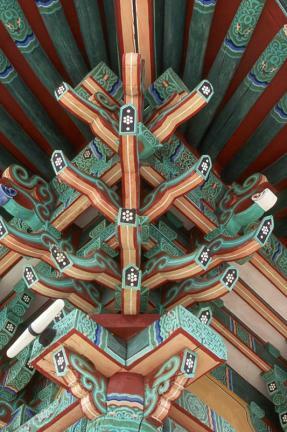 The building sheds important light on the wooden Buddhist architecture of Joseon, and more particularly on the decorative painting techniques of this period.